Here is my pattern for Amanda, an 18 inch (45cm) fabric doll. I have traced the pattern pieces onto 1 inch (2.5cm) square paper. One quarter inch seam allowance is included on all pieces. The pattern pieces are on the following 2 pictures. 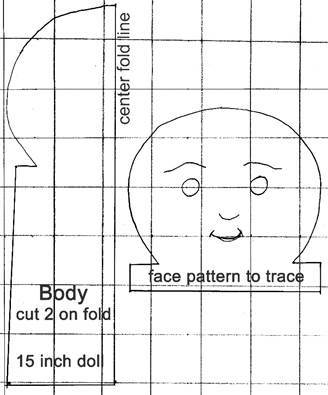 The first is the body, arms and pattern for tracing the facial features. The second picture is the legs. 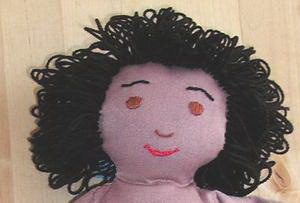 I embroider the eyes, nose and mouth in 6-strand floss before sewing doll together. 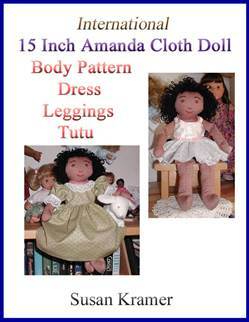 Here are sewing instructions to make Amanda, my 18 inch (45cm) fabric doll. You'll need one quarter yard plain material for body, arms and legs. 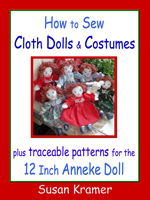 I use 6-strand embroidery floss for facial features, which I embroider on doll before I begin sewing doll body together. 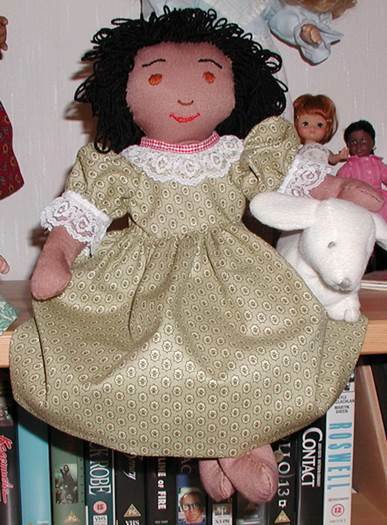 If you know who is going to be the lucky recipient of your handmade doll it is fun to match the eye and hair color while making the doll. For the doll wig allow 1 ounce of acrylic or wool yarn. Be sure to examine photo carefully for help in construction. - Cut 4 arm pieces from pattern and use two pieces for each arm. - Sew seams leaving shoulder edge open for turning. - Turn pieces right side out and stuff loosely with fiberfill. - Stitch across arm, seams matching as in photo, halfway between wrist and shoulder, to create elbow. If you wish to create a wrist - here is a technique I use with a long hand sewing needle: Knot a few stitches on wrist back seam and insert needle through to front of wrist. Then take one stitch and pull slightly to form crease and carefully make a few knotted stitches to hold crease securely. - At shoulder edge of arm bring arm seams together to match at centers and baste across opening. 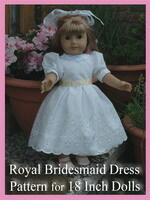 See photo of doll. - Cut 2 legs on fold. Very important - the back of the leg is on the fold and the back of foot seam begins just up the fold edge at the top of the heel and continues down around the foot and back up to top of leg. - Clip curves and turn inside out. 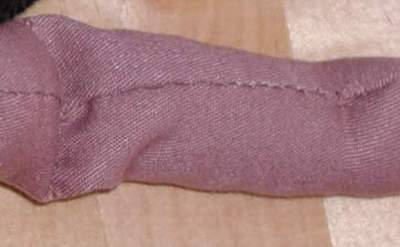 - Stuff each leg loosely using the eraser end of a pencil to nudge stuffing into toe and foot. 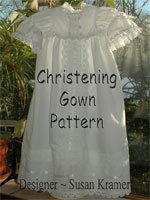 - You'll have just one long leg seam and this is aligned in the center front of the leg. - Top stitch across leg to form knee joint at the half way point, between top of foot and top of leg. - Baste across top of legs keeping seam at center front of legs. If you wish to create an ankle - here is a technique I use with a long hand sewing needle: Knot a few stitches on ankle back seam and insert needle through to front of ankle. Then take one stitch and pull slightly to form crease and carefully make a few knotted stitches to hold crease securely. 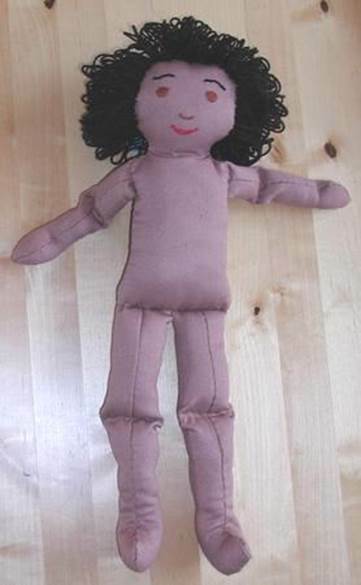 - With extremities folded in toward center of doll front, sew stuffed arms and legs to right side of fabric on doll front, at side of body at shoulder, and across lower body, right next to each other. Place doll bodies right sides together, and stitch around perimeter leaving a space for turning right side out between one armpit, and side of body down to top of leg. Turn right side out and stuff; blind stitch opening. Now it's time to sew on the yarn doll wig. Be sure to use washable yarn. Both wool and acrylic work well. For instructions to knot on wig go to this page. 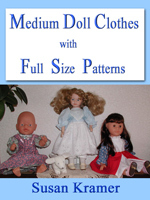 Have fun making your new doll!